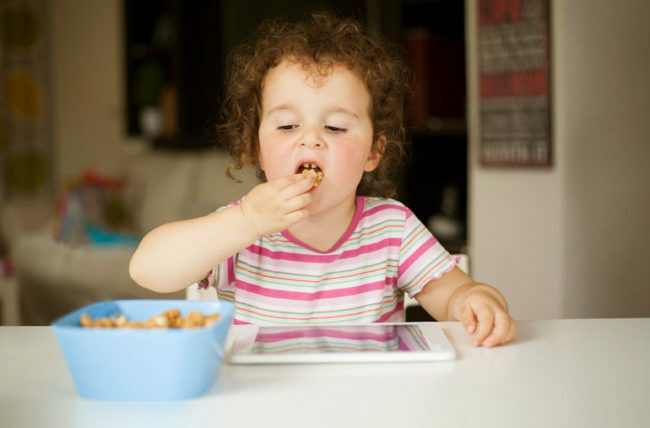 Can Social Media Influence What Your Child Eats? A study shows that ads on TV and social media have an impact on a child’s food choices. Every parent expects, at some point, their child will ask for a food item they saw advertised online or on TV. Now, a recent study reveals how much impact social media has on a child’s food choices. Researchers looked at 176 children between the ages of 9 and 11. Children were randomly assigned to view different profiles of social media “influencers” with healthy snacks, unhealthy snacks or non-food products. The study found that the kids who viewed the social media posts with unhealthy snacks ate more calories and had significantly increased intake of unhealthy foods than the children who viewed the healthy snacks or the non-food items. However, the children who viewed the healthy snacks weren’t compelled to eat more healthy foods. Child psychologist Kate Eshleman, PsyD, did not take part in the study, but says it probably comes as no surprise that advertisements are very persuasive to children. “The advertisements have a lot of impact on the kids,” she says. “They see it and they want it, and parents have to be prepared to limit those things in the home.” Dr. Eshleman says avoiding the pitfalls of social media marketing comes down to communicating with children about healthy choices. This includes which food items should be in the home and which ones should not. Dr. Eshleman says parents should always know what their children are watching so they can talk about the content they’re viewing. Dr. Eshleman notes the study results don’t mean parents shouldn’t allow their children to view content online. But she recommends making sure they’re watching it in plain view – on a computer that you can see, or on a television – but not on a hand-held device. Does Your Phone Come Between You and Your Kids? Could Early Exposure to Peanuts Help Avoid Allergy Later?